When attempting to justify his Executive Order to review and expedite construction for the Dakota Access and Keystone XL pipelines, Donald Trump stated, “As you know I approved two pipelines that were stuck in limbo forever. I don’t even think it was controversial. You know, I approved them and I haven’t even heard one call from anybody saying, ‘Oh, that was a terrible thing you did.’” However, Trump’s attempt to pass off his pipeline approval as insignificant, free of controversy, and free of any blame attaching to himself, proves misleading when analyzing its legal framework and the response of the American public. 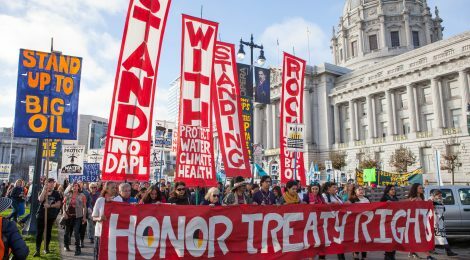 The Dakota Access pipeline is a highly-contested issue, as demonstrated by a multitude of protests that began a whole “movement, which started in early 2016, had small roots but grew into the thousands, drawing support from Native Americans from across the country, as well as activists who joined in solidarity against the proposed route of the 1,172-mile Dakota Access Pipeline just north of the reservation.” This executive order proves highly problematic and egregious because it breaches various environmental acts, such as the Clean Water Act; it infringes upon the preservation of cultural artifacts of the Sioux tribe, as guaranteed by the National Historic Preservation Act; and finally, it disobeys the Treaty of Fort Laramie, in a way that epitomizes a regression to times of colonial strife and racism, a theme deeply ingrained in America’s cultural heritage. Not only would this pipeline have a distressing impact on the Sioux tribe, but it would also violate specific environmental acts, including the National Historic Preservation Act of 1966. In 1992, The National Historic Preservation Act was amended to preserve items of religious and cultural significance. As the Advisory Council on Historic Preservation explains, “Section 101(d)(6)(B)…. requires Federal agencies, in carrying out their Section 106 responsibilities, to consult with any Indian tribe¹ that attaches religious and cultural significance to historic properties that may be affected by an undertaking.” Robinson Meyer of The Atlantic elaborates: “the pipeline will pass through and likely destroy Native burial sites and sacred places…For instance, they described a large stone feature that depicted the constellation Iyokaptan Tanka (the Big Dipper)—a sign that a major leader, likely a highly respected Chief, was buried nearby.” Therefore, before any project can be constructed on native land, the constituents must consult the natives to determine the negative implications of the project on the preservation of their religious and cultural artifacts. However, this mandated discussion never occurred. The burial site of a highly respected Chief carries “religious and cultural significance,” which, in turn, underscores that the construction of this pipeline is in violation of the National Historic Preservation Act. Further controversy arose due to the Treaty of Fort Laramie, signed in 1851 with the Sioux tribe, that protects the health of their people and their natural resources. The third article of this treaty facilitates the protection of the Sioux from plundering: “The United States bind themselves to protect the aforesaid Indian nations against the commission of all depredations by the people of the said United States.” This article inherently implies that the destruction of the tribe’s resources is in violation of the treaty. In addition to detrimental environmental, legal, and political ramifications, the construction of this pipeline limits the Sioux tribe’s accessibility to water—a situation that the tribe is acutely aware of. One man in the Sioux tribe explained the tribe’s worried sentiments when stating that: “You can live without money. You can live without oil. But you can’t live without water”. The U.S. Fish and Wildlife Service completed a haphazard environmental assessment that completely disregarded the enormous risk that an oil spill would pose: “In conclusion, wetland and waterbody construction crossing methods, implementation of erosion control devices, and PHMSA requirements would minimize potential impacts to water quality from construction and operation of the Project.” The report’s phrasing underscores its apathetic response to violating equal access to clean water. The word “minimize” proves ambiguous for it implies that there will be damage, but that it ought to be kept to as low a level as possible. However, the Treaty of Fort Laramie clearly established the complete protection of the Sioux land. Therefore, even a “minimal” amount of damage to the water supply violates this law. As David Archambault II, chairman of the Standing Rock, surmised: “This disregard for tribal diplomatic relations and the potential for national repercussions is utterly alarming.” The Dakota Access Pipeline will run through and pollute protected waterways; it will cause unprecedented and extreme environmental damage. Legally, it is not only in violation of just one law but a multitude, including the National Historic Preservation Act (as the destruction of culturally significant artifacts is highly likely, and the tribe itself was never even consulted), the Clean Water Act (since it has the potential to entirely pollute the waterways which the Standing Rock natives depend on for sustenance), and finally, the Treaty of Fort Laramie. The Dakota Access Pipeline is far more than just environmentally or legally problematic. It represents a regression to a time when the fundamental human rights of the Sioux nation were not established—a time when their people as well as their resources were exploited by European colonizers. and Social, July 02, 2015, , accessed March 02, 2017, http://www.greenmedinfo.com/blog/special-report-standing-rock-environmental-and-social-justice-consequences-dakota.